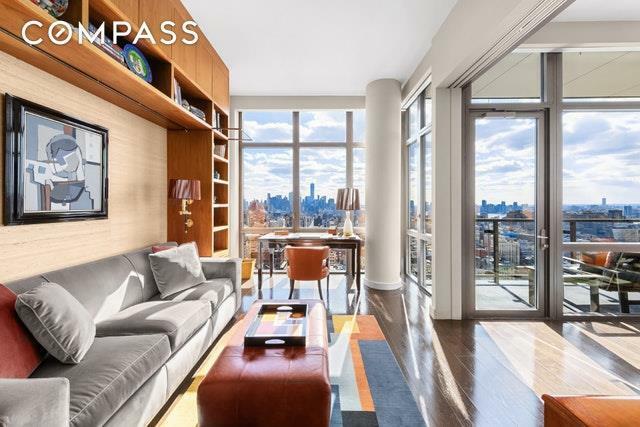 This spotless, high-floor, light-filled, corner 2-bedroom 2-bathroom home is perched atop Chelsea's premier, centrally located luxury full-service condominium, The Chelsea Stratus. 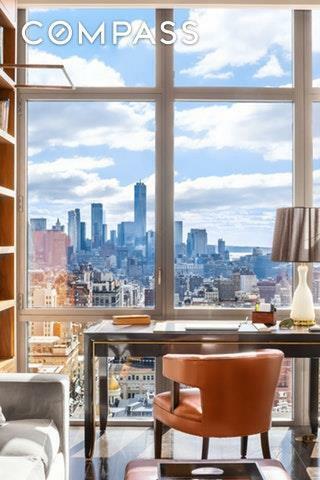 This 1,242 square-foot apartment offers floor-to-ceiling windows with dramatic southern exposures that showcase breathtaking vistas of the Manhattan skyline and sunsets that could leave you speechless.A gracious entry leads to the generously scaled living room that has the abutting second bedroom/study opened up via a huge pocket door to deliver the perfect setting for elegant entertaining. The 80sf balcony is the perfect moment for morning coffee, take in the views or enjoy the remarkable sunsets. New, gleaming oak hardwood floors feature throughout. The windowed chef's kitchen is fitted with Pietra Cardosa stone countertops, Macassar Ebony wood cabinetry, and stainless steel appliances, a wine fridge, plus an eat-in counter for more casual dining.The plush master suite affords equally unobstructed views south. The en-suite bathroom features a separate soaking tub and shower. The walk-in closet is outfitted to perfection with carefully crafted walnut millwork. The guest bedroom/study opens to the living room with a pocket door but is easily closed off to function as a bedroom. 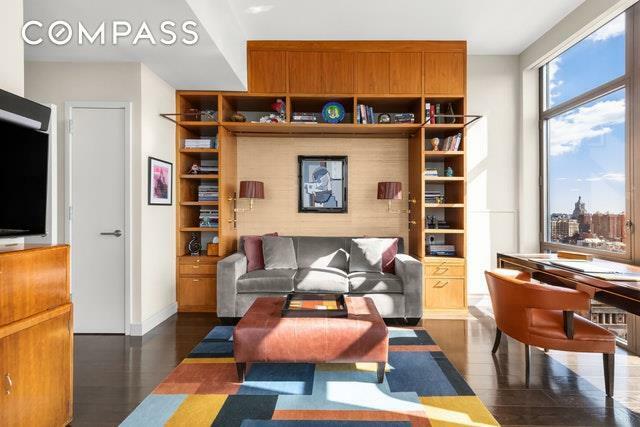 It too is south-facing with big, open views and an abundance of light. A full bathroom with a walk-in shower is positioned across the hallway.This home features central air-conditioning, a washer/dryer, custom shades and Sonos sound system with speakers in every room.Built within the past decade, the Chelsea Stratus is conveniently positioned just moments from Madison Square Park and famed Eataly food emporium. This refined building offers a full suite of amenities, from 24-hour doorman & concierge services to an ultra-modern, large fitness center surrounded by windows, an indoor basketball court, a large, elegant residents lounge with fireplace & large-screen TV, a billiards room, a private dining area with a catering kitchen, an outdoor landscaped garden, and a spectacular Thomas Balsey-designed rooftop terrace with helicopter views and a rooftop dog run. 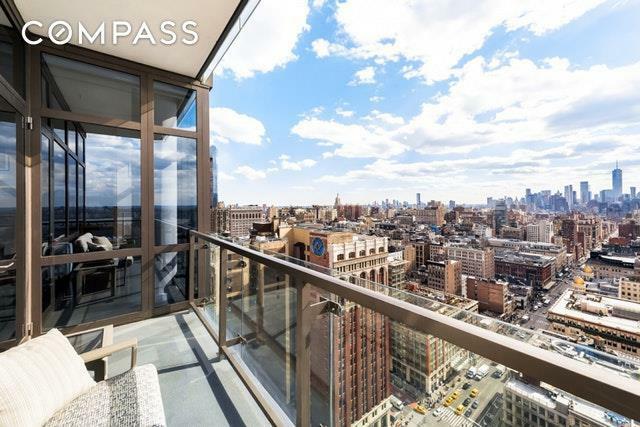 Centered in Chelsea with unlimited shopping, restaurant, and public transportation options including a Whole Foods Market, Trader Joe's and Fairway Markets, not to mention the Highline Park, Hudson River Park, and newly opened Hudson Yards and West Chelsea Arts District close by.